Charlton House. Photo © David Secombe 2010. Nowadays just another stop on the railway line, a part of the sprawl of outer London, Charlton has, to its great and inexplicable glory, one of the most stunning pieces of Jacobean architecture in the whole country. This is Charlton House, dating from 1607 and built for Adam Newton, tutor to Prince Henry, James I’s eldest son and heir to the throne. It is the most wonderful building, made all more wonderful by the drabness of its surroundings. To get to it from Charlton railway station requires an uninspiring five-minute slog south on Charlton Church Lane before you reach the brow of the hill: a redbrick church – St. Luke’s – on the left, ranks of flats on the right and in the centre, hemmed in by a car park and a stretch of lawn, a fabulous dark red brick Jacobean mansion, decorated with white stone quoins and dressings, and with a great wedding cake frontispiece, involving a huge bay window and the main entrance porch. 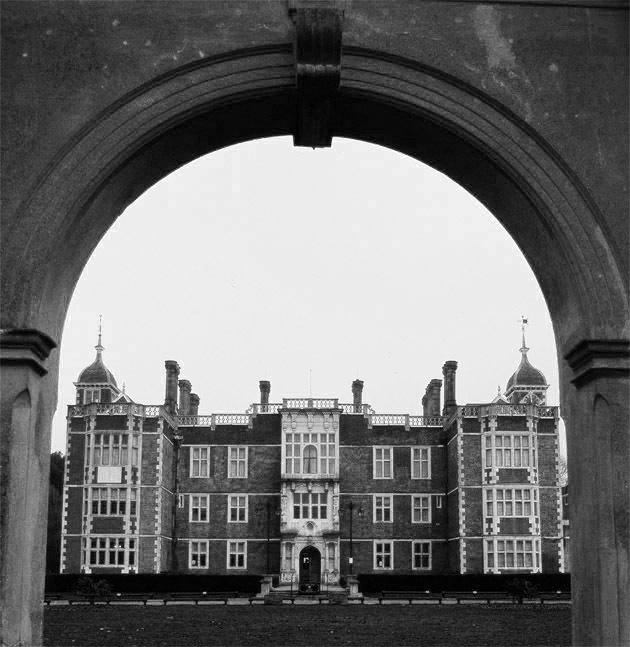 Sir Niklaus Pevsner claimed that Charlton House contained ‘the most exuberant and undisciplined ornament in all England’; while Ian Nairn drew a metaphor – aptly enough – from Jacobean melodrama, seeing the building as ‘Sinister poetry: the Duchess of Malfi in SE7′. John Evelyn, writing fifty years after the house was built, described the view from the house as ‘one of the most noble in the world, for city, river, ships, meadows, hill, woods and all other amenities’. At the end of Lights Out for the Territory, Iain Sinclair’s epic psychogeographical trek across London, the author visits Charlton House and ruminates upon its brooding presence and desirability as a residence for an aristocratic version of himself. Psychogeography is a much-derided concept, and it has been derided in these pages more than once (most recently by Andrew Martin earlier this week), but Charlton House is the kind of place which makes one wonder whether there might be something in it. It just seems monumentally wrong. In the midst of the anonymous south London sprawl it is spectacularly incongruous, but it isn’t just that (in fact, Charlton is the only London village where all the traditional elements remain visibly intact: the big house, the green, the church, the village). There is something else going on. I once made a short film in which Charlton House featured as the main location. The film was a sort of parody of the English ghost story tradition, three men holding a night-time vigil in the Long Gallery of the House in the hope of seeing ‘something’. When being shown round the building during a recce, we ascended to the Long Gallery in a conspicuously modern elevator. I expressed my surprise at such an unexpected convenience, and was told that when the lift was being installed workmen discovered the body of an adolescent boy walled up behind one of the fireplaces. How long it had been there, no-one could say.